In this Thursday Therapy episode, I help you understand if you are a good candidate for bariatric surgery, explain how bariatric surgery can work with non-dieting principles, and outline the mindset and support required to make surgery a complete success! Excellent question Amy. Bariatric surgery is something that a whole lot of people have a whole lot of opinions on; some people think it’s a silver bullet that’s just going to solve all of your problems, other people feel like they wouldn’t wish it on their worst enemy, some people feel like it’s an easy way out, other people feel like it’s a viable last resort and we’d actually love to hear your opinion too. So, if you’d like to comment with your experience or thoughts on bariatric surgery, do so on this post or you can join our psychology of eating movement weight and body image support group. They know that I’m presenting on bariatric surgery this Thursday Therapy and they’re already talking amongst themselves, it’s a wonderful group where over a thousand members and it’s a great supportive group where you can share ideas, a couple of laughs and support but in the meantime what I’m going to do is give you my three most important considerations around bariatric surgery from a psychologist point of view. I think sometimes we get too hung up in ideology and opinion, so what I’m going to do is, I’m going to base my ideas on evidence and my pretty substantial experience working with bariatric surgery patients pre-and-post-surgery. The first thing that I want you to know about bariatric surgery is that it’s not fit everyone. Obviously, I can’t take you through every consideration but what I’m going to do is I’m going to take you through some of the best practice guidelines so you can understand whether you’re a suitable candidate for bariatric surgery. If you’re not of course you can probably find a surgeon that will do your surgery but it might not end up being everything you want it to be or you could end up having a surgery that’s done more harm than good, so I would really encourage you to pay attention to these guidelines which are really actually very good guidelines. They’re widely clinically accepted and they make a whole lot of sense in helping you determine whether the surgery is good option for you or not. The first criteria is your body mass index. A lot of people who know me, know that I think we don’t use the body mass index very well and that it is not a wonderful measure but here I think is the exception; the body mass index rules say that you should be of a BMI of 40 or above or between 35 and 40 with significant comorbidities. So, comorbidities are health problems that are directly related to your weight such as sleep apnoea and diabetes. If you don’t know how to calculate your BMI just do an internet search for BMI calculator and you’ll be able to figure it out really easily. The second criteria when you’re considering bariatric surgery is that you have to be able to have shown that you haven’t had success with traditional diet and exercise, while you’ll see from our previous Thursday Therapy that that’s not actually that hard because most people who lose weight through diet and exercise will lose it then regain it all with interest, what we call the Nike swoosh of weight loss. We do have to be able to show that you’re not one of those small percentage of people who can lose weight and keep it off with diet and exercise. A small caveat on that is that if you’re in that BMI of 35 to 40 you may also consider a health at every size or a weight neutral intervention as these interventions have been shown to improve physical and psychological health without worrying about weight loss. The third consideration is that, to make you a good candidate for bariatric surgery, you need to know the pros and cons of your particular procedure and as well as having a really good working understanding of your procedure, have a good understanding of the alternative surgical procedures that are available to you, so you can make sure that A: surgery is the right option for you and B: that the particular surgery that you are going to undergo is the right one for you. The fourth consideration is that surgery is not a good option for you if you have a current serious psychological health condition. So, while people with stable and mild psychological health considerations like, depression or anxiety often find a real improvement with their mental health following surgery, if you have a serious and active mental health condition like schizophrenia, you’re in the midst of clinical depression or you’re having delusions or suicidal thoughts, then surgery is not a good option for you at this time. So, there the four criteria that you should at least consider as a starting point and I would really say to you to ignore these at your own peril. I see plenty of success stories and plenty of absolute failures in my work as a psychologist working with this population and you want to make sure that before you go down this path, you’re at least thinking straight that this is going to be a good idea and something it is really going to help you rather than a silver bullet that’s going to fix all your problems. It’s not for everybody, so please consider deeply and thoroughly whether it’s for you. The second thing I want you to know about bariatric surgery is that if you are a good candidate, it can potentially be very helpful for you. Bariatric surgery from the research is the best way to lose a significant amount of weight and keep it off. Not everybody who is overweight or even in the obese BMI category needs to lose weight to become healthy. A lot of people can become healthier without significant weight loss and we do see psychological and physical health improvements in some studies with no weight loss and in other studies with around 10% weight loss, so I’m not saying that you need to lose a significant amount of weight but if you’ve gotten good medical advice that you need to reduce a significant amount of weight, for medical reasons, it is the best way that you can do that that we have currently. It’s a very interesting thing for me to say, who’s a psychologist who works from a non-dieting perspective, because non-dieting which is about removing the focus from weight and focusing on your behaviours and bariatric surgery seem ideologically opposed, but what I find practically and clinically and some people may think that I’m crazy here, is that the two can actually practically work beautifully together; for example, in non-dieting one of the aims is to listen to your hunger and fullness. Now you can learn this without surgery but, sometimes those hunger and fullness signals are just little whispers and for a lot of people that I see who have had bariatric surgery, those whispers turned into screams and shouts, oh my goodness I’m really hungry, stop you are full, so they become easier to listen to. Another aim of non-dieting is to reduce the emphasis on weight and focus on your day-to-day self-care. So, one way to do that is to improve your body image and stop the struggle with weight, but the bariatric surgery is such a powerful tool for weight loss that with the right mind-set the bariatric surgery can take care of a lot of the weight loss while the person just focuses on their day-to-day self-care. So, for many reasons bariatric surgery can actually work really well with non-dieting principles. I also experience that another part of non-dieting or intuitive eating, is about noticing how food affects you. With bariatric surgery that becomes very clear, without bariatric surgery the person might feel a bit sluggish or a bit bloated and sometimes with the surgery the person will feel like they want to go and vomit quickly or they have some yucky experience so they need to go to the toilet, we call that dumping. So, those signals can get a lot louder. Finally, if the person has the right attitude towards the surgery, they can actually use the surgery to help them develop a more positive relationship with food. Often people trying to lose weight, the focus is so much on can’t eat this, have to limit that, but with the right mind-set because the person who has undergone bariatric surgery realizes that there is such little space for that food, the focus can become about what you do eat and making sure you get enough nutrition, I think it’s always better to have a positive focus than a negative one. I’m going to read you a little client story that comes from our Facebook group and I think she’s a wonderful example of how the two combine beautifully. Lisa says, “I had surgery a year ago and I’m well on my way to a better and healthier life. I’ve been on a diet since I was 11 and pretty much tried everything. I just ended up getting bigger and feeling bad about myself. Having a gastric sleeve gave me space to reset my eating patterns and food loosened its control over me. It has changed my life for the better but it is not the answer to everything, it’s merely a tool to use for better health. I won’t ever be thin and truth be told I don’t want to be, but I do want to live life fully and not be held back by carrying too much weight. Bariatric surgery is serious business and not for everyone but it was right for me and my only regret is not biting the bullet and doing it sooner.” The third thing that I want you to know about bariatric surgery is that it’s not a silver bullet, it’s a tool. If you work with the tool you’re likely to get really good results, but if you try to work around the tool, which you’ll do if you’re not in the right headspace, you can have all sorts of complications you, can have suboptimal weight loss, you can have weight regain, you can have vomiting and dumping, you can have malnutrition, problems with bone density and hair loss, there can be all sorts of complications. So, you really need to consider not that you’re just doing bariatric surgery if you do it but that you’re doing a program of lifestyle change that begins with bariatric surgery. As well as your surgeon, the GP or the doctor that does the fills of your band, if you have a band, needs to become your best friend and you really need to be seeing them regularly for at least the first year, then as required after that. With the dietitian, you need to be seeing the dietician at least monthly for the first-year post surgery and then regularly after that. What that will mean is that you’ll get more weight loss but you also get healthier weight loss as you’re focusing on your nutrition as well as making sure that you’re eaten the way that will help you release weight. You also need to have a great relationship with your psychologist, sometimes it’s more than just nutritional education, for example, if you are an emotional eater, you will find a way to sabotage the surgery or if you don’t find a way to sabotage the surgery and you’re left without this coping mechanism, you could be psychologically, even though you’re thinner, in a worse place than you were before, so you really need to consider that this surgery is just a tool and that you are going to have to work with the tool. Think long and hard and if deep down you know that you’re not committed to making that work, you’re probably better off not to do the surgery. I hope this session been valuable to you. Guys, I think we all know someone who has done this surgery or who is considering the surgery a lot of us know someone who has done really well with the surgery some people know people who have not done so well and some people know some people who are in that middle space and yet to see whether they were really going to get great results or not. I’d really love you to share this video with them, if you’ve got a friend or a family member or you’re a part of a bariatric surgery group, that’s what Thursday Therapy is all about. Before we finish up I do want to give a quick shout out to the team at Queensland Bariatrics; Blair and Jenny and Lara are a wonderful bariatric surgery group. I think Blair is one of the most brilliant surgeons, not only because he’s a very skilled surgeon but because he’s a super caring surgeon. 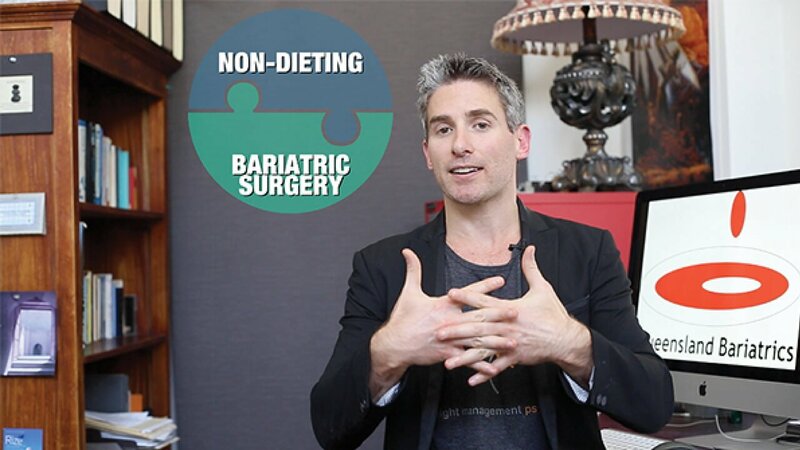 I say to people he’s the only surgeon I know that has sent me text messages about a client and also, I really value the team at Queensland Bariatrics because they value what we do, the psychology, and the interdisciplinary care with the dietician. Queensland Bariatrics have a great team of dietitians and psychologists, including myself, that work with them regularly and it’s a really great place to go and investigate whether the surgery is right for you, if it is make sure that you get the right surgery for you and get the right type of support that can really lead to lasting transformations. Thank you for watching Thursday Therapy. If you haven’t already, subscribed the Thursday Therapy for more free sessions with me and I’ll look forward to seeing you at our next session. You still need to address lifestyle factors if there’s an underlying emotional reason why there was some sort of, you know, food craving or food desired and that still needs to be addressed, because bariatric surgery won’t address that. Hey Buddy!, I found this information for you: "EPISODE 13 Thinking About Weight Loss Surgery…". Here is the website link: https://www.weightmanagementpsychology.com.au/episode-13/. Thank you.